You should know all ready if I titled a section "the plan" that it didn't work out. Of course it didn't. I PLANNED to have a friend run with me a part of the way, but the layout of the course, and when "crew" could be present and when they couldn't sort of hindered the plan. not knowing the exact details of the course did as well. Ultimately I asked the RD and he suggested my friend could run the last 5 or so miles from Sunset Fields to the end. whereas I was hoping he could trail the last 15 or so, but the course didn't allow. So then I considered him running along with me from the first Sunset Fields visit. This was greatly discouraged, so I just chalked it up as a rookie mistake and jumping the gun on the excitement of having Eddie run with me. Thankfully he understood, but I know he was disappointed. The reason I wanted such a plan was because Terrapin's 50k was such an emotional experience. I liked the idea of either having someone to unload emotions on, or (maybe better yet) help buffer them away. Countless times I heard that this was someone's first ultra. I wouldn't have suggested this for anyone's first, but It hunk I may be wrong. elevation profiles can be so intimidating, but they only tell a small part of the story, until you really get out there and experience it. 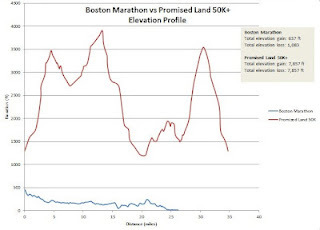 For example check out this pic of the Promise Land 50k elevation profile as compared to the Boston Marathon elevation profile that circulated on Facebook in the days after Promise Land. Of course, I love to irony of the photo, but really these are 2 separate challenges. 2 very different races. As for this being someone's first ultra. in hindsight I'm not sure if it actually may be a GOOD first ultra. As daunting as that elevation profile to the left looks! My first consideration of running PL50k was one year ago at Terrapin when I finished the half. Dr. Horton said to me "Are you running Promise Land?" for which I said "I've not even run a full marathon, man!" and his reply "YOU DONT HAVE TO! - PEOPLE DONT GET THAT"... and I learn that he is right. So PL as a first - here's my thoughts. the course is tough enough that you just can't run for much more than 6 miles at a time. then you hike up some big 'ol climb, and then yoga re back to running again. give it a half mile to find your running legs again and settle into a stride, drop a couple miles. then uh-oh, hiking agin up the next big climb. The pattern of this course is a lot of stop and go. Climbs that most mortals wont even consider running up. but hey you are traversing mountains. A first timer still needs to know what they are getting into and should prepare to be on their feet for 7 or 8 hours, maybe more. Countless Mountain Junkies were present! I really liked the local-Roanoke community support we had with each other there. Many familiar faces. I think that was in part what made Terrapin so difficult of me (one of the many reasons). I enjoy sharing new moments with others. Dragging a friend through something they've never done. It is exciting to me to share it. I like being the encourager. My friend Ed McKeown was taking the challenge! I was excited for him and encouraged by his determination, motivation and courage to do it. With so much of the unknown before me as well, we shared many moments together. I've started to plan my approach to ultras in 3 sections. 10 miles or more for each section. This held me divide up the elevation profile in my head, so I can anticipate - though I usually end up totally forgetting the elevation profile and just take it as it comes. today's approach was to take the first 10 much slower than previously. At Terrapin I dove in too fast, and I knew this. I hoped to stay with Ed for at least the first, and hopefully the first 10 miles. Not only was I with Ed, but Sean Cooper, also doing his first ultra was with us for much of that time as well. I enjoyed the conversation with those around us, the encouragement that was given and received from Ed and Sean. I think after that first 10, Ed seemed positive and hopeful for the remainder of the day. Slowly I began to pull away and I knew it was time for me to increase my overall pace. This was my first event wearing my Garmin Forerunner 110. Lydia had bought it for me for my birthday and we both know I'd been wanting one for a long time now. I considered all the models, but settled on the 110, cause it was a watch I could wear normally, and it would do all the fancy running stuff I wanted it to do. Sure there was other features that I would have liked it to have, but I knew I was capable of just getting all way too geeked out on it, so I settled for the simple and stayed with the 110. It does all the necessary things to help with my training and I'm very happy with it. Ed was my coach for how to use and operate the watch, as he too uses the 110. I dont recall much about the middle section, but I do recall really enjoying the first downhill sometime after mile 10. beautiful single track, fairly steep but I could finally open up and RUN! I was passing a few here and there. Always thinking that they would pass me again sometime. interestingly this race was much different. The second and third sections after mile 10 to the end, I was consistently passing others. The closer I got to the end and was still passing others, I knew I had prepared with taking my first 10 miles carefully - I finally did something right! The most difficult climb was up Apple Orchard Falls. It happens to you (and I mean it HAPPENS TO YOU) between miles 27 and 30 or so and then you are in for a nice long downhill - the same hill that was the first climb. Coming up AO Falls was tough. I wasn't expecting any rain. Not that I would have done anything differently, but it began to rain just as I hit the aid station at the bottom of the mountain. Rain was one thing but cold rain is another. But again... not that I would have done anything differently. Maybe I would have carried gloves but they would have done little good. and I don't have a super cool thin running jacket, but I hope to get one someday. What came from the sky at that moment has been described as freezing rain (it indeed was freezing cold!) sleet and hail. I don't know what a weatherman would say it was, but I was super cold! The only solution was to move and not stop. I was unable to run due to the steep hike that was before me and I felt for those behind me that had to endure it for longer. The climb which was around 2 miles, but I'm sure it was less than 3, yet it seemed to never end. Fingers immovable. My exposed forearms would sting and radiate over my whole arm when a rain drop hit it just right. I was unable to squeeze my water bottle but I knew I still needed to drink and remain hydrated. I still had a lot of miles left. About 5 miles AFTER I finished this climb... if I finished this climb, but I HAD to. There was only one way out and that was within what lay before me, and so onward I pressed. At the top I needed to refill my bottle, but only stretched out my hand to the AS volunteers who removed my bottle for me and refilled it. I struggled to get it back on my hand. It was the same at the next and last AS as well. Just frozen. I knew this was purely a mental thing I had to overcome here. Sure the climb was a physical feat, but if I wasn't focused mentally and if I diddnt stay focused and positive - if I got negative and let MISERY sink in. I knew it would be so much more difficult. I recalled the saying on the shirt from the Willis River 50k that I ran in January "Pain is expected, Suffering is optional" I knew not to let the suffering set in. Stay positive I kept telling myself "Don't get negative (Win at this mental game), press on, you'll be bragging about this tomorrow". I appreciated that the other runners I was around said very little. Every once in a while a slight complaint of what froze or what they could no longer feel. I was thankful I could still feel my feet unlike one of the ladies around me at the time. I considered that they too were fighting that mental game and their silence affirmed that. Tammy Gray (she doesn't know I know who she is he-he) was at the top and said "you are freezing, you've got to keep going" She's a voice of experience and I knew she was right. I spent little time at the AS and took on down the hill. I knew this was a chance to move more and warm up, and it was a welcomed change. I diddnt exhaust myself on the climb but I was excited to still be pressing on... thinking to myself "I'll be bragging about this tomorrow" I even shared that thought with another runner or two on the climb to try and encourage. The long gravel road toward the end, as expected, felt much longer than it was on the way up the mountain. I was still pleased to be passing runners. I glanced at my watch to see what my pace was, I was logging 8-minute miles for the last couple of miles and I was excited to be feeling this good. From gravel, to paved and then the distant sounds of the finish line. The cowbells and cheering for the runners ahead of me. I turned onto the camp property and let out a victorious Woo-Hoo, and then crossed the line at 7:45 or so. Immediately I thought, "better beat that next year". Despite the discomfort experienced one hour ago on that climb, I was all ready planning a rematch of man vs. mountain. The most important thing I did was a low fiber and high carb diet for 3 days leading up to the race. I diddnt have to "pit-stop" in the woods like I had for the last 2 50k events. I read about going low fiber. and I mentioned it to a GI surgeon that I work with who knows quite a bit about running. He said it sounded like a good plan. It felt good to get his approval. The familiar faces were welcomed and I thoroughly enjoyed talking with Jerry and Dru and Andy and Ed and Gina and Helen and Sean and Anita and Jay after the race (I'm sure I forgot many others). Veggie burger, chips and water was on the menu for me. Phones didn't work so I was unable to call home and share the excitement. I was excited to have in hand my finisher's shorts. What a better finisher's award than just another cool shirt. I'd been needing a new pair of shorts anyway. I suggest a new pair of shorts every year!!! I'm still wearing the Montrail Masochist shoe. I'm anticipating I'll be getting a new pair soon. I've had minimal foot and toe problems. I'm nervous what a new shoe will bring. I'm curious how to progress from this solid foundation of the 50k that I've built up, to whatever it takes to go for about 12 hours and finish the Mountain Masochist 50-miler in November. I've run one ultra every month since December. I'm asking and listening to any advice from others. My calendar shows that I'm basically taking the month of May off from the really long run. June includes the Conquer The Cover trail marathon and then the Eastern Divide 50k, also. I expect I will try to do some back to back runs, say a 20 miler and then 15 or so the following day on tired legs. I've also been told just take it slow and I'll be fine. But still I signed up for the 40miler in Douthat State Park put on by Odyssey Adventure Racing - The Trail Running Rampage in September. I also know that Jerry Ballard will be doing all these listed events with me, as well as the MM50-miler. Cant wait for those days ahead.